Queen’s researchers demonstrate proof-of-concept therapy for genetic disorders. Researchers at Queen’s University have published new findings, providing a proof-of-concept use of genetic editing tools to treat genetic diseases. The study, published in Nature Scientific Reports, offers an important first step towards treatment for a rare liver disease, as well as other disorders caused by genetic mutations. “Using the CRISPR-Cas9 system, we have demonstrated an important proof-of-concept in using gene editing to treat genetic disorders such as Arginase-1 deficiency,” says Angie Sin, a postdoctoral research fellow in the Department of Biomedical and Molecular Sciences at Queen’s. Dr. 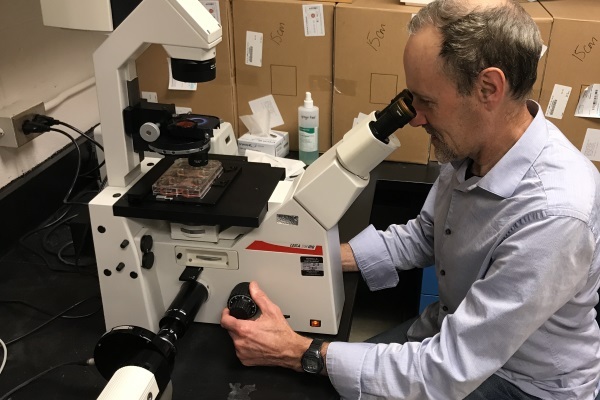 Sin, working under the supervision of Queen’s researcher Colin Funk (Biomedical and Molecular Sciences) examined the use of the revolutionary CRISPR-Cas9 gene-editing tool, in combination with stem cell technology to repair Arginase-1 deficiency. The Arginase-1 enzyme plays an important role in the urea cycle – a key liver function that converts ammonia to urea for excretion in urine. Patients with a defective Arginase-1 coding gene are unable to convert ammonia, resulting in impaired ability to produce urea, as well as stunted growth, excess arginine in the blood, and progressive intellectual and neurological impairment. The study offers an important first step towards treatment for a rare liver disease. Like many genetic disorders, Arginase-1 deficiency is autosomal recessive – requiring two copies of the defective gene – and does not tend to result in symptoms before the age of three. In testing the technique, Dr. Sin utilized a cell model with an induced genetic deletion, resulting in a defective Arginase-1 mimicking the disease in humans. Using the CRISPR system, Dr. Sin was able to reincorporate the repaired exons into the cell’s genetic structure and restore enzyme function. While there are still many obstacles between the results of the cellular model and full-scale patient treatment, Dr. Sin explains that a new therapeutic strategy would offer tremendous benefits over current treatment methods. Current treatment for the disease is restricted to pharmacological agents, such as nitrogen-scavenging drugs, as well as protein-restricted diets. Demonstrating successful use of CRISPR gene editing technology for Arginase-1 deficiency would also offer clues as to treatment for other similar disorders. The full text of the study, titled Proof-of-Concept Gene Editing for the Murine Model of Inducible Arginase-1 Deficiency, is available online from Nature Science Reports.